The Fujifilm X30 premium compact offers a fixed 28-112mm f/2.0-f/2.8 lens and 12Mp 2/3-inch X-Trans CMOS II sensor with the Optical Low Pass filter removed. If you’re after a small camera with great image quality but have decided not to go down the mirrorless hybrid route, a premium compact is your next best choice. 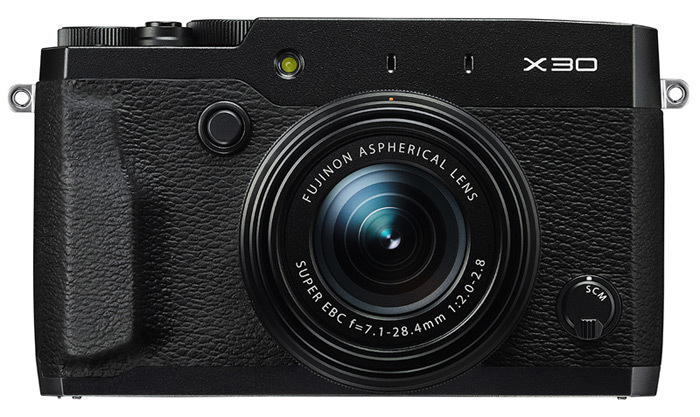 The Fujifilm X30 uses a 2/3-inch sensor that is bigger than the sensor used in most traditional compact cameras to offer improved image quality. Whilst the 2/3-inch sensor isn’t as big physically as the CX format, 4/3rds or APS-C sensors used in most hybrid cameras, Fujifilm’s new type of sensor technology called X-Trans has been receiving some very positive feedback for image quality. X-Trans sensors work in a different way to most image sensors and arrange the pattern of blue, red and green pixels in a more random way, compared to the more traditional Bayer array system. Feedback on image quality from the X-Trans sensor has been generally positive; however the testing algorithms used for our DxOMark Sensor Scores are designed for the Bayer array and therefore we’re unable to test the latest crop of Fujifilm sensors ourselves at the moment. So the heart of the X30 remains the same as its predecessor, featuring a 12Mp sensor, Fujifilm’s EXR processing II engine and ISO sensitivity between 100-3200, expandable to ISO12800. Instead of an optical viewfinder the new Fujifilm X30 now features an Electronic Viewfinder, referred to as a REAL Time Viewfinder, and Fujifilm claim it’s the biggest and fastest in class with an impressive 2.4m-dot resolution. The fixed 28-112mm f/2.0-f/2.8 remains the same from the X20, offering a 4x optical zoom, 3 stops of image stabilisation and a minimum focusing distance of just 1cm for close up macro shots. The LCD screen has had an overhaul however, with the X30 featuring a larger 3.0in, higher resolution 920k-dot model, which also tilts for framing up at awkward angles or shooting at waist level. There’s also a new control ring on the lens for changing aperture and shutter values, as well as 2 dials and 6 function buttons on the camera for lots of intuitive control. The performance specs are pretty impressive too, with continuous burst shooting at 12fps and a dual Contrast & Phase Detect autofocus system. In Phase Detect mode the X30 boasts fast focusing in just 0.6 sec, but will automatically switch to contrast detect if and when required based on the subject and scene in front of it. There’s full HD movie capture at 60/50/30/25 or 24fps and the X30’s hotshoe, for mounting either Fuji’s EF-20 or more powerful EF-42 external flashguns, can also be used to connect the MIC-ST1 external stereo microphone for improved sound recording. The Fujifilm X30 is available in black or black/silver and can be pre-ordered now priced at $599.